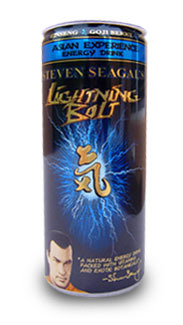 Steven Seagal's Lightning Bolt is a brand of energy drink that is produced by Steven Seagal Enterprises. The soft drink was introduced in July 2005 by independent distributors and is promoted by action movie star Steven Seagal. Each can bears a picture of Steven Seagal and the character known as "CHI", which stands for power, and energy in many Asian languages and cultures.The beverage is billed as the "first energy drink to be made of 100% juice. ", and also claims to be the first energy drink to contain Tibetan Goji Berries and Asian Cordyceps (said to be one of the most rare and treasured herbs used in Chinese and Tibetan medicine; Seagal discovered the benefits of Cordyceps while researching immune builders in Asia). It is available in over 60 countries, including Wales and Zambia.